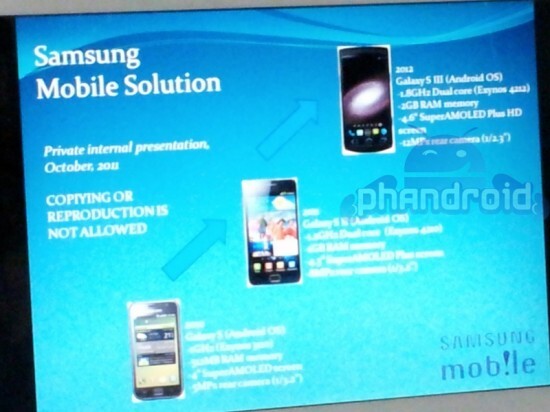 Samsung has been successful with its Galaxy S II and the handset is indeed selling like hot-cakes, and now according to an image that seems to be from an internal presentation, it seems that the company is already working on the Galaxy S III. The snapshot of a slide shows us the evolution of Galaxy S line up. According to the slide, Galaxy S III will run on a dual-core 1.8 GHz Exynos 4212 processor with 2GB RAM, have a 4.6 inch Super AMOLED Plus HD display and a 12MP camera on the back with W750 BSI CMOS sensor. Though it’ll run on the Android Ice Cream Sandwich OS, the device will retain the four physical buttons. It may also support NFC and LTE according to other rumours. The slide can be a fake but the specs seem to be worth believing. As of now we can just wait and watch and expect this piece of information to be genuine.